The Rick's Cafe Americain is a Moroccan Restaurant built on the model of the Casablanca movie. Offering enthralling mountain vistas, the restaurant is popular for offering the authentic Moroccan, American and Mediterranean cuisine. 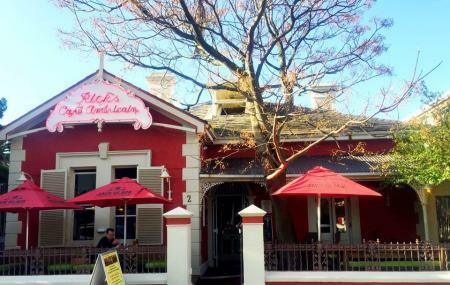 The Victorian Cottage in which the Rick's Cafe Americain is set up is 110 years old and is decorated with traditional decors and 120 seats. You can have food in the main lounge with the cocktail bar and the three fireplaces or enjoy drinks while sitting on the roof deck enjoying the sun. For your party needs, there is the TV Lounge. Cold and hot tapas, salads, falafel, mushroom risotto, burgers, grilled steak and fillet, Tajines, Pudding, and Seafood are their specialties. I have been there once to watch a football match. Really good restaurant. They amazingly good burgers and the staff has a great vibe, are really friendly and they know what they are doing. It is perfect for a nice evening to enjoy or meal or go for a sportevent. It belongs to the slightly more expensive restaurants but it is still a reasonable price. The location is also pretty good and it is a cozy place where you can spend a longer time. By far the most outstanding service I’ve ever received from any restaurant throughout the world! We had JP as our waiter. Taking orders and serving the eldest lady first to the youngest male last. Immaculate etiquette. Food was very genourous and tasty. And when there was something wrong they were very apologetic and replaced it in no time. Our table of 11 had not a single complaint. Will definitely be back. This is a wonderful place situated in a very nice area in a nice Victorian era house. The place has a great atmosphere to it. The food is wonderful especially the jalapeno poppers. They have a big selection of beer and gin. I would definitely recommend this place.